When the shots shoot themselves, you are just the servant moving the cue you have become the master. If you are lazy in practise, you will be lazy in the contest. Practise with sincerity of heart. Move through each level of skill development with the clear knowledge that you have no limits. I accept the things I have no control over. Be comfortable with the results, no matter what they are. Be relaxed on every shot. Be deliberate on all break shots. Be focused on all draw shots. Do not be preoccupied with results. 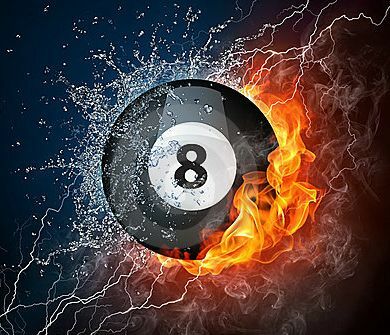 Glide your cue through the cue ball as if it was not there. Your eyes should be perfectly aligned to the shot. =>Never shoot until you are ready. See the spot on the object ball and deliver the winning stroke. Shoot each shot with 100% conviction. Have a perfect follow through on each shot. Stay down to watch the object ball disappear into the pocket. Shoot one shot at a time. Enjoy your performance and be apart of each shot. Be free to shoot each shot. Do not let anything interfere with your performance. Make no judgement on your performance. It is as it is, and you should fully accept it. Make your decision, lean into the stance, sight down the shaft and deliver the stroke. You have unlimited ability to grow in this sport.